Porgera Joint Venture (Barrick) is facing a likely court battle in relation to plagiarism of ideas under the Copyright Act after PJV claimed to have initiated the Tax Credit Scheme (TCS) concept which was claimed to have been borrowed from a local man from Enga (Lagaip-Pogera) in 1989 when it was under Placer Pty Ltd. This was revealed in an exclusive interview with the Post-Courier in Mt Hagen last weekend by the initiator and founder of the concept Mr James Rau who presented the original copies and process he went through to make his proposal originally known as PJV state Tax Cut proposed in 1989 to then Placer PNG Pty Ltd to borrow and use to stem the confrontation and mistrust among the project affected communities. Mr Rau said the brainchild of TCS was not Porgera Joint Venture as uttered by PNG Chamber of Mines and Petroleum executive director Greg Anderson in a speech delivered during the 13th Mining and Petroleum Conference held in Sydney last Month, December 2014, and reported in the Post-Courier on December 23, 2014. "Porgera Joint Venture (Barrick PNG Ltd) is the pioneering company in using the TCS concept but TCS itself is not the brainchild of PJV but rather a borrowed concept from me," Mr Rau said. Mr Anderson when contacted for comments by the Post-Courier said he did not know whether there was an original individual initiator but said he saw the copy of a formal letter by PJV to the State stating the TCS was the brainchild of PJV. Mr Rau said PJV had already admitted and accepted liability, but to date had not paid any consultation fees from the borrowed concept. A copy sighted by the Post-Courier revealed that the contents indicate PJV had been liable to pay Mr Rau certain fees with half of the contracts under TCS infrastructure developments to be awarded to Mr Rau but to date had failed to materialised. 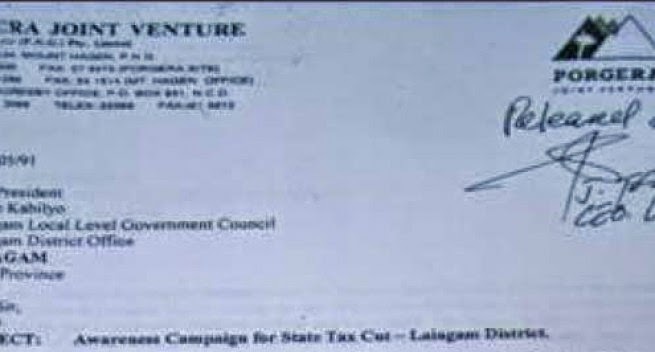 Continuous letters to PJV for fees in the form of consultancy over the years had fallen on deaf ears, instead PJV had directed Mr Rau to the state and provincial government to deal with the matter as the funds are owned and controlled by the State. The current commercial Services manager of Barrick through its legal officer Christopher Trainor when contacted by the paper last Friday referred the matter to the government stating "Barrick don’t get any benefit from this concept, they pay taxes to the government for infrastructure development" and even refused to answer as to who the initiator of the TCS concept is. The provincial government through their then legal officer Mr Harry Derkley stating in one of their letters, dated May 14, 2001, "that TCS was established by an act of parliament and has been used by other resource developing companies apart from the PJV. The appointment was made and approved by PJV without any form of consultation for approval by the EPG or state authorities".